Mushroom Corals have features of both sea anemones and stony corals, but lack a skeleton and long feeding tentacles! The Corynactis genus has some incredible color combinations, and the brilliant Strawberry Anemone is no exception! The intriguing mushroom corals in the Corynactis genus come in oranges, greens, pinks, and reds, which can be almost fluorescent and are extremely vibrant. These colors look especially awesome with animals that have clear tentacles and contrasting colored tips. To top that off, those tentacles can then be branching tentacles. The Strawberry Anemone, or Club Tipped Anemone, is an amazing variation to the Corallimorphidae family. These corallimorphs grow only to 1" (2.5 cm), so they can be kept in a small nano reef of just 1 gallon or more. Some other common names it is known by are the California Sea Anemone, Californian Coral Anemone, Club Tipped Sea Anemone, California Club-ray, and Strawberry Corallimorpharian. This is truly an amazing animal that will be a great addition to your cold water aquarium.Only a few relatives of this group live in warmer waters. For the most part, chillers are essential for these mushroom corals. They also cannot handle high water flow and need very little light. Its suggested that they be hand fed at night as many Corynactis anemones are nocturnal. Also provide trace elements including magnesium and iodine. 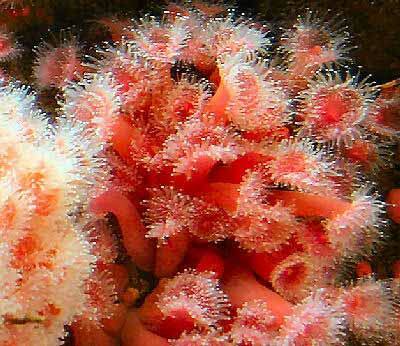 The Strawberry Anemone is a hardy, durable cold water species. They do need cool temperatures that would require a chiller. But if given a cold water reef environment with proper care and feeding, they can do well. Also with the correct husbandry they will reproduce in captivity. Found in the Corallimorphidae family, or mushroom corals, the Strawberry Mushroom Anemone is found along the California coast in cold waters. They can be pink to dark red or yellow to orange, brown and whitish colors have been found. They only grow to 1" per individual, however their colony can reach 66 feet across! Provide these beauties with 59˚ to 68˚F (15˚to 20˚C) and feed them once a month, and unlike Pseudocorynactis, they will eat any time of the day, not just at night. This makes them easier to care for as far as cold water species are concerned. Beware, because any creature crawling along the top of the colony will be required to stay for dinner! Distribution / Background Mushroom Coral Information: The Strawberry Anemone or Club Tipped Anemone Corynactis californica was described by Carlgren in 1936. Other common names this mushroom coral is known by are California Sea Anemone, Californian Coral Anemone, Club Tipped Sea Anemone, California Club-ray, and Strawberry Corallimorpharian. Besides the Strawberry Anemone, there are several species of corallimorphs within the Corynactis genus including C. caribbeorum and C. viridis. C. viridis is commonly known as the Jewel Coral Anemone. Other common names these corallimorphs are known for are White Ball Corallimorph, and Orange Ball Corallimorph. Where Mushroom Corals Are Found: Species in the Corynactis genus are found in the Eastern Pacific and North Atlantic oceans in temperate waters. There are only a few that are from tropical waters, but these are rare and not as available to aquarists. The Corynactis californica is found in the eastern Pacific Ocean, carpeting the bottom of the Cambell River in British Columbia and Monterey Bay in California. Mushroom Coral Habitat: Mushroom corals in the Corynactis genus are sometimes found attached to live rock, although are also found in sandy and rocky areas near the reefs. They are found at various depths, often in groups. The members of the Corallimorphidae family, in contrast to true anemones, are not colonial. They may live in groups but there is no contact between the individuals. The Strawberry Anemones C. californica are found in various other areas as well, like shaded vertical rocks over 300 feet deep (90 m) and also tide pools in temperatures that range from 59° to 68° F (15° - 20° C). Under the correct husbandry they will reproduce in captivity. Predators are unknown. Description What do Mushroom Corals look like: The Corynactis genus are basically a coral without a skeleton and their internal structures are the same as stony corals. These corals are closely related to stony corals with basilar muscles, and are less like anemones except for the fact that neither have a calcareous skeletal structure. The top of their body or the upper surface is called the oral disc. The stalk area, which is very small, is called the column and it is located just above the pedal disc which is where they attach to surfaces. On the surface, or oral disc, they have feeding tentacles to capture prey that hold several types of stinging cells. The tentacles are clear to white and have club shaped or fringed tips. They can be white, pink, red, orange, green, and clear in color. The C. californica is bright red with clear to white tentacles with fringed tentacle tips that can be white or clear. Mushroom Coral Life Cycles: These corals grow to about 1" (2.5 cm) depending on the species but their life span is unknown. Difficulty of Care Mushroom Coral Care: This corallimorph is rarely available for sale. If you are able to acquire them, the Strawberry Anemone is quite hardy. They are moderate to difficult to care for since they need cool temperatures that would require a chiller. They also cannot handle high water flow and need very little light. They may need to be hand fed at night as many are nocturnal. There is not much information on several of the Corynactis species, yet general good husbandry, water quality, temperature and appropriate feedings are basic. Some Corynactis mushroom corals ares from warm and temperate waters. Obviously, the warm water species are easier to care for with basic mushroom husbandry. Foods / Feeding Mushroom Coral Feeding: The Strawberry Anemone or Club Tipped Anemone is a carnivore from temperate waters. All the cool water Corynactis anemones need to be hand fed small pieces of raw fish, shrimp, mussel flesh, and tubifex worms. Feed 2 to 3 times per month. Warm water Corynactis need to be fed the same foods several times a week to encourage division. Aquarium Care Water changes of 10% bi-monthly or 20% a month are typical. Monitor your water quality for your particular situation and adjust your water changes accordingly. Do not over skim since the Corynactis genus need nutrients to survive on and will not do well in a pristine environment. Provide proper magnesium levels, also some claim proper iodine levels are beneficial. Due to their toxins, active carbon is also a good idea with larger groups of mushrooms. Aquarium Parameters The typical reef environment is what is needed for your Strawberry Anemone; i.e. live rock in a reef environment for cold water. They need live rock or some other solid material they can attach to. This is a cold water animal and a chiller is needed to provide the proper environment. Compatibility and Social Behaviors Care needs to be taken when housing these animals. The Corynactis genus are aggressive. If they are near another coral they can cause other corals to loose tissue, recess and/or die. They typically overtake other corals as they multiply. The C. californica will extrude their mesenteries into certain sea anemones and corals and kill them. They will extend their filaments resulting in all other corals, including zoanthids, to retract, move, or die. The Corynactis genus will only get along with their own species, and will not even tolerate mushroom species outside their colony. Even in one genus, if the color is different, again a different species, the weaker mushroom will detach and find another location. Strong water movement will also cause them to detach as well. Slow moving fish and shrimp run a risk of being consumed by the Corynactis genus. Budding: The first is called budding, which is when the mushroom will allow a small piece of tissue to grow and form from the parent, which in turn becomes a new animal. Laceration: The second way is laceration, which happens when they move slowly over the surface and leave behind "mini-me" pieces that will eventually form into mushrooms. Fission: The third way is fission, which is seen a lot in bubble tip anemones, and this is when they basically split themselves right in half, though the center and then wrap back around themselves to create 2 smaller versions. Transverse Fission: The fourth is called transverse fission where the top is pinched off and floats away to reattach in another spot and start a new colony. The stalk that remains, reforms into a new mushroom clone. Remove the mushroom to be divided from the main tank. Using sharp scissors or a scalpel, cut the mushroom in half right down the center, through the mouth. If a second cut is wanted, take one of the halves you just cut and cut again through the mouth. Place the mushrooms on loose rubble in water flow that is weak to very low. It would be suggested to do this in a small "recovery" tank with the same water as the main display since they may get lost and they also will be exuding a lot of toxins from their little surgery. This will allow them to reattach to a piece of rock and heal, then at that point, they can be moved to the main display. The smell you will experience are the toxins these animals use for pushing other corals out of their growth path. It would be prudent to wash your hands if you didn't use gloves. Within a few days all of your "cuts" will become new mushrooms and they can now be glued, sewn or pinned where you would like if they have not attached to the rubble. Potential Problems The Corynactis genus are disease resistant, and only affected by improper husbandry. Warmer water than suggested will eventually kill any Corynactis from temperate waters. Predators are unknown. Availability Mushroom Corals for Sale: The Strawberry Anemone, as well as other species in the Corynactis genus are very rarely for sale. They are very difficult to come by and pricing is not possible at this time.